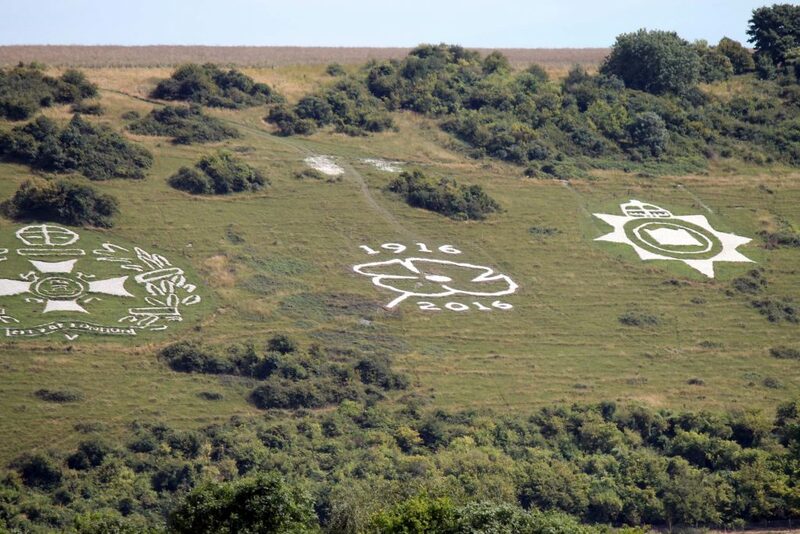 The Fovant Badges Society is a voluntary organisation which has the objective of maintaining the regimental badges that were carved into the chalk downs above the village of Fovant by the soldiers of those regiments. The Society is determined that the badges shall remain an historic, fitting and truly visible memorial to the soldiers who passed through Fovant and its neighbouring villages on their way to the Great War, many never to return. We hope that the website provides you with an insight into the work of the Society to maintain the Badges and its equally important role to communicate the history of the Badges to all age groups. Maintaining the Badges is expensive costing the Society around £30,000 per year and whilst we do receive some help from various institutions we rely heavily on the donations of our members and of the general public. To all of these we say thank you. The Centenary Poppy between The Post Office Rifles and Devonshire Regiment Badges.